James Durham’s newest book, Alert! 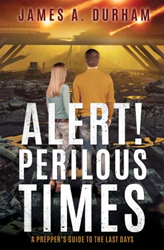 Perilous Times: A Prepper’s Guide to the Last Days ($17.99, paperback, 9781545638859; $8.99, e-book, 9781545638866), provides in-depth look at the end times and how to prepare by developing mental toughness and becoming spiritually strong. Filled with encouragement and faith-building ideas, this end-times preparation guide uses Scripture and accompanying text, rather than fear, to help readers prepare themselves now. James Durham has served in ministry for more than 50 years, including 13 years as a pastor and nearly 30 years as an active duty Army Chaplain. He has previously published 12 books and regularly speaks around the world. Xulon Press, a division of Salem Media Group, is the world’s largest Christian self-publisher, with more than 12,000 titles published to date. Alert! Perilous Times: A Prepper’s Guide to the Last Days is available online through xulonpress.com/bookstore, amazon.com, and barnesandnoble.com.